Five years ago, Alan and Cindy Gensamer moved to the New River Valley from Houston, Texas. It fit their criteria for a place to retire: close to colleges and universities, airports, museums and cultural venues, plus a wide range of outdoor recreational opportunities. And the climate – not too cold, not too hot. They brought myriad talents along with warm, charming personalities. The 1½-story Cape that caught their eye is at the end of a wooded, uphill country road then up more on a long, winding, single-lane driveway. To paraphrase Dorothy: “I’ve a feeling you are not in Houston any more. You must be over the rainbow!” Figuratively, they are over the rainbow with enthusiasm for and contentment with their uniquely crafted mountain lifestyle in Giles County. 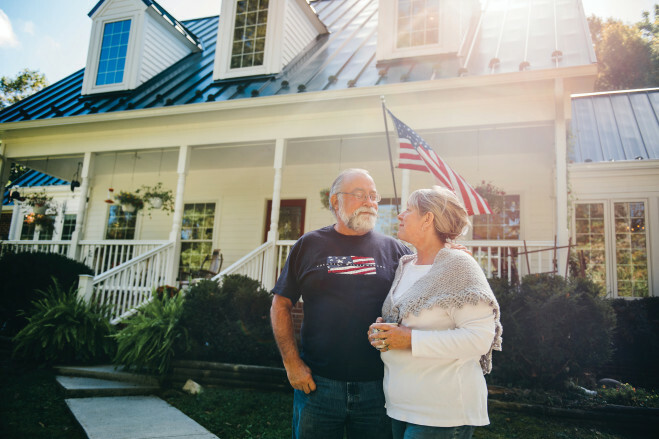 “The house was built in 1997,” says Cindy, “and we spent a year and a half renovating and expanding it.” Sitting on 30 acres, the couple almost completely remodeled the house from the roof to the basement and everywhere in between. The kitchen takes center stage in any home, and this one is not only very large with a unique pantry, farmhouse sink, upscale appliances, dumb waiter, soapstone and butcher block, but also has especially striking countertops. One can measure antiques by decades, usually centuries, and there are many lovely pieces in this home. But the Gensamer’s kitchen counters are assessed in hundreds of millions of years. “It’s called glaciogenic diamictite,” explains Alan, a retired consulting geologist with a life long association with rocks. “It is a jumble of rocks from a glacial deposit with sedimentary, metamorphic and volcanic particles up to two billion years old. The source for the components is thought to be parts of Eastern Brazil and possibly Western Africa. This particular formation was purportedly created before the opening of the Atlantic Ocean.” It is stunning for the fascinating assortment of geological materials and textures. 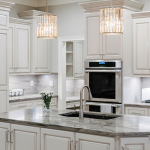 The kitchen island cupboards are a very attractive, smooth, marbled hickory, and the others on the walls are white. “The soapstone around the sink abutting the butcher block is in place to keep the butcher block from being adjacent to water,” relates Cindy. The open concept living and dining spaces which flow toward the kitchen showcase Alan’s handcrafted Windsor chairs, special antiques and intriguing pieces from their four years in Indonesia. The master bedroom and bath are on the main floor, with two guest rooms upstairs, all lovingly furnished with quilts and Americana decorative style. Many of the paintings and folk art designs are handcrafted by Cindy. A couple of doors are barn style floating sideways on tracks above the doorway, and the dumb waiter takes groceries from the lower level near the garage with a push of a button to just outside the kitchen. Over the new 2-car garage is the expansive FROG room (Fun Room Over Garage). It has a cathedral wood ceiling and tons of natural daylight for enjoying the pool table, dart board, television and games. “This could be a nice efficiency apartment or airbnb option,” Cindy adds. One way to integrate into a new community with aplomb and equanimity is to focus on local suppliers and contractors for a renovation project. It’s likely that Alan and Cindy endeared themselves to the many NRV tradesmen they specifically sought out and offer accolades for their quality and commitment. Alan and Cindy are just as interesting as their house. She has a gigantic craft space where the two-car garage used to be, with a wine room and root cellar/pantry nearby. Alan is a gardener, and Cindy preserves their harvest with dozens of jars of tomatoes, applesauce (Doe Creek Farms apples), pickles and relishes, and jams and jellies in the pantry to prove that point. Alan is a talented woodworker with interests in turning, carving, general carpentry, and a special interest in handmade Windsor chairs utilizing traditional hand tools. Cindy is a folk artist, painter, quilter, stained glass artist, decorator and teacher. Alan plays guitar and they both play the dulcimer (one of their three made by Alan). They did much of the renovation work themselves including design, general contracting, painting, trim carpentry, drywall, landscaping, and some electrical, plumbing and tile work. The couple loves to socialize and “do impromptu parties”, so the spacious kitchen, lovely outdoor decks and open living room and dining areas are perfect for crowds as well as intimate dinners, for any reason, in any season. The house is nestled among the trees in summer. Once the leaves have fled, winter brings spectacular views of the surrounding mountains and valleys. They call it their jewel at the top of the mountain. And they well know they are not in the humid, subtropical climate of Houston any more.